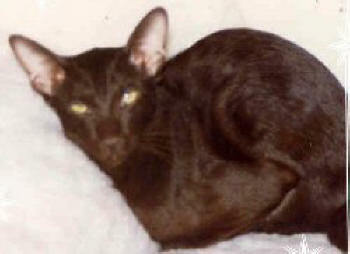 The oriental has the elongated foreign type of the Siamese. It is an elegant breed, which should be well balanced, muscular in appearance, with long graceful limbs, a slender neck and a long, whip like tail that is free from any kink or defect. Their coat should be short, fine textured, glossy and close lying. They have large ears with width between the ears narrowing down to a fine muzzle and forming a balanced triangle, the head is wedge shaped. The Oriental Longhair (Angora), the semi longhaired version of the Oriental, should have a free flowing, silky coat, and is recognised in all the same colours and coat patterns as the Oriental. They come in over 200 different colours, patterns, and colour schemes. Including shelf (Havana), non shelf (Tabbies), Shaded, Silvers (Smoke and Tabby) and a variety of patterns. From the earliest days of breeding, kittens of a different colour would appear in Havana litters. These were a pale grey colour, and became known as the Foreign Lilac (Oriental Lilac). Other solid colours soon followed, Oriental Blacks, Blues, Whites and the newer colours, such as Caramel, Fawn, Cinnamon, Red and Cream. Orientals are very intelligent, and love to be part of the family. Playing games with bouncy balls, catnip mice, and feathers. They are attention seekers, and can be very extroverted, especially the Torties, and love to vocalise. They are very easy to groom, a weekly brush with a soft brush or daily hand grooming will keep their coats, free from dirt and keep it glossy and smooth. Grooming from kitten hood, will strengthen the bond between you and your cat. Even the Angora, with its semi longhaired coat is a lot easier to groom than a Persian. Orientals are full of energy, and love to play chase, and will retrieve small balls, but if left alone for any length of time, they can become bored very quickly. Orientals are very loyal, loving and demonstrative, and can forge strong bonds to their owners.